I recently wrote a tutorial demonstrating how to leverage the integrations between Spring Boot Actuator and Pivotal Cloud Foundry 1.11, posted here in the Pivotal content library. TL;DR: Pivotal Cloud Foundry 1.11 provides some really nice integrations with Spring Boot Actuator-enabled applications/microservices, giving you vital tools for monitoring, introspection, and troubleshooting quickly and effectively. Like this post? Follow me on Twitter for more! And be sure to check out the Related Posts below. As you begin to divide conglomerate functionality into discrete, decoupled microservices, you introduce a number of opportunities and challenges into your system(s). The opportunities are often well-known, including (and especially!) development velocity, fidelity/fit (functionality matches requirements), scalability, and a host of other “ilities”. Challenges also exist of course, including the question of how to gain visibility into end-to-end interactions involving multiple microservices across process and network boundaries. 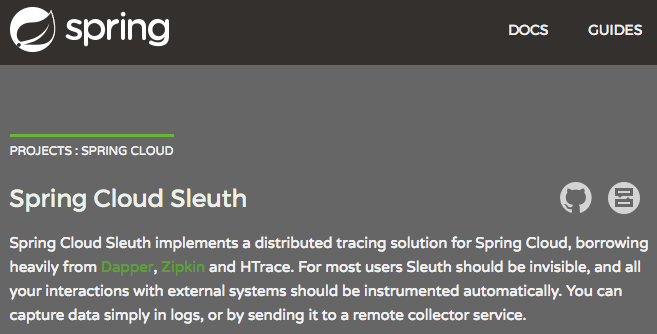 Spring Cloud Sleuth provides a lightweight, configurable, and easy way to begin capturing trace information within your distributed system. In 2010, Google published their seminal paper titled Dapper, a Large-Scale Distributed Systems Tracing Infrastructure. In 2012, Twitter created Zipkin during their first Hack Week, based upon the Dapper paper. A Span is the basic unit of work. For example, sending an RPC is a new span, as is sending a response to an RPC. Span’s are identified by a unique 64-bit ID for the span and another 64-bit ID for the trace the span is a part of. Spans also have other data, such as descriptions, key-value annotations, the ID of the span that caused them, and process ID’s (normally IP address). Spans are started and stopped, and they keep track of their timing information. Once you create a span, you must stop it at some point in the future. A set of spans forming a tree-like structure called a Trace. For example, if you are running a distributed big-data store, a trace might be formed by a put request. Sometimes within the Spring space, you hear about Sleuth and Zipkin within the same discussion, often within the same breath…which understandably can result in a bit of confusion on the listener’s part. Without diving too far down the rabbit hole, Sleuth provides the means to instrument your Spring Boot/Spring Cloud applications; Zipkin can take that data and provide a means to monitor and evaluate it. Zipkin provides numerous integrations, but of course, you can also use other log monitoring & management tools to collect and analyze that vital data. This post focuses upon Sleuth and provides a quick on-ramp to getting started capturing basic information for each span. To do that, I’ve created these two projects that allow us to quickly add trace & span (& more) information to our interactions and verify it in our logs. The only thing of particular note is the @Log statement. Lombok provides this capability to reduce the usual boilerplate code required to get a logger via LogFactory. NOTE: We’re running the provider on port 8080 (Tomcat’s default port), so we change our consumer service’s port to 8081 to avoid conflict. The same note about Lombok’s @Log applies here as well, of course. Examining our log entries for both services (above), we see that Spring Cloud Sleuth has placed our spring.application.name (as designated in each service’s application.properties), the appropriate trace id, and the span id specific to this hop within the logged information. Of course, Sleuth captures much more data and allows for extensive customization (including enabling additional elements you specify to be captured, adjusting sampling rates, & more), and Zipkin remains a topic for another day. But this post should have provided a quick springboard (!) into using Spring Cloud Sleuth for better insight into your microservices-based system of systems. Many of us use JSON almost exclusively now, which is generally a good thing. But what happens when you need to “speak XML” with your Spring Boot REST endpoints? Now, to test our results. To do so, I’m using the excellent httpie, with its shortcut that allows the omission of the hostname for localhost. Thanks for reading, be sure to follow me on Twitter for future tips! I was leading a workshop yesterday and this question arose: Is it possible to filter requests by header content using Spring’s various request mapping (@RequestMapping, @GetMapping, @PostMapping, et al) annotations? Not only is it possible, it’s easy, and the implementation is concise & clean! Let’s take a look. NOTE: The above examples use httpie “shorthand”, which assumes localhost when the base URL is omitted. That’s all for now, but stay tuned (or follow me on Twitter) for more quick (or more lengthy) Spring tips! s.b.a.e.m.MvcEndpointSecurityInterceptor : Full authentication is required to access actuator endpoints. Consider adding Spring Security or set ‘management.security.enabled’ to false. This is far less likely to be a suitable solution for production apps, though. 🙂 Enabling Spring Security properly to secure access to your application is a far more production-ready option. If you can load successfully the various Spring Boot Actuator endpoints but get a 404 error on /actuator, the primary (navigable) Actuator endpoint, you are hitting a different (yet also easily resolved) snag. The hint is in how I phrased the difficulty: the primary (navigable) Actuator endpoint. That’s all for now, but stay tuned (or follow me on Twitter) for more quick or lengthy Spring tips! Click here for more information about Spring Boot Actuator.